Every night at dinner I try to serve a salad with our meal, and I'm always looking for new salad inspirations to jazz up our evening greens. Last night I was making our salad, and wanted to add something new and exciting. I remembered back to several summers ago when my mom used to make this salad. The pistachio crusted goat cheese was amazing. But one slight problem. No pistachios. No Goat Cheese. So off I went scrounging for substitutes. What I found was half a block of cream cheese and a mason jar full of pecans. The result was these delicious little balls of cream cheese with crunchy salty pecans on the outside. They were the perfect addition to our salad. Scoop out 1 T of cream cheese from a block for each ball you'd like to make. Roll each scoop in between your hands until it forms a sphere. Lay the pecans down on a cutting board, sprinkle with pinch of salt. 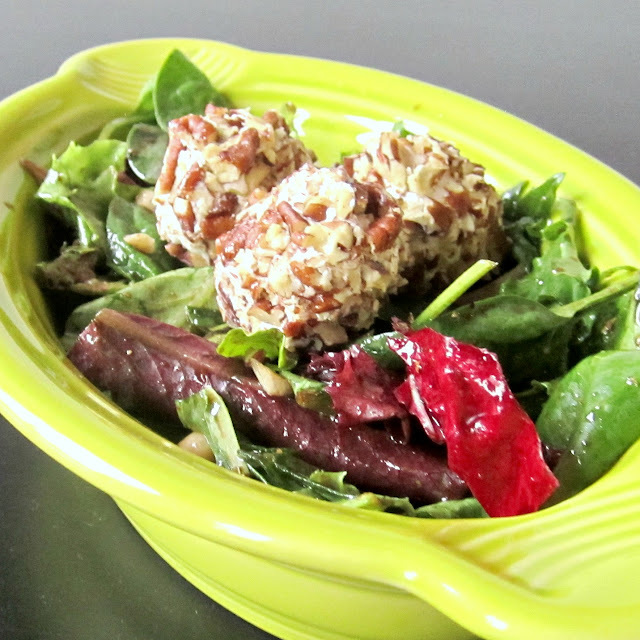 Roll each cream cheese ball in the pecans until the outside is completely coated. Serve on top of a salad. Great served over spring greens with balsamic vinaigrette.